I rarely bake, but when I do, I start by cheating. My sister’s baby shower called for going above and beyond and a previous roommate’s cake business had me itching to try my hand in making cake pops. They are so fancy, delicious, and party-perfect! Unfortunately for a rookie, it’s a lot of work! I think once you get the hang of it it’s not so bad.. But I made 66 cake pops or so, and it took all night. 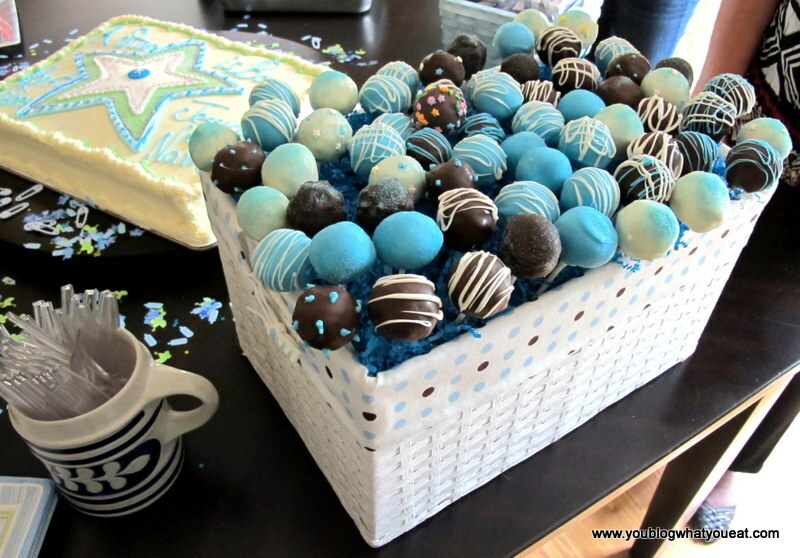 Blue, white, and brown cake pops make the perfect baby-shower treat! For the cake mix, I used whatever brand was on sale. I tried both a chocolate cake with chocolate icing, and a yellow cake with french vanilla icing. You can experiment with different combinations of flavors. For the candy melts, I got chocolate (brown), white chocolate (white), and a white chocolate flavored blue melt. Bake the cake as directed, and let cool completely. Completely crumble the cake into a large bowl, rubbing between your palms to break up any pieces as much as possible. Discard any tough pieces that were edges or the tops, if they are not crumbling well. Mix 1/2 cup or so of frosting into the cake mix until it is somewhat sticky. Melt the candy melts per the instructions (be careful, if you get impatient you will ruin the candy melts). Dip the end of each lollipop stick into the candy melt and then insert it about halfway into a cake ball. This way, the candy melt will harden, holding the lollipop stick onto the cake pop so it won’t fall off. I began putting the ones I’d finished back into the freezer while completing this step. Let the cake pops set in the freezer for up to 1 more hour. To make colored sugar, you can take plain white sugar and add it to a shaker or tupperware container. Add 1 or two drops of food coloring (depending on the desired result) per half cup of sugar). Shake the container vigorously until all sugar is uniformly colored. This worked great for me and saved me some money! This is how I created the baby blue sugar. Melt the desired candy melt color for the base of your pops in a deep narrow container that still has some room on the sides if you were to put a cake ball in it. As the candy melts begin to cool you will have to reheat them slightly. Take a cake pop by the lollipop stick and dip it into the container at a slight angle, and twirl until the cake pop is coated. Remove the ball from the candy melts and twirl it between your fingers to remove excess candy coating, and tap gently on the side of the cup to again remove any excess. The candy melts go on thick so it’s a bit of work to get the right amount on each cake ball without overusing the coating. Place the lollipop stick into a styrofoam base (flower arrangement foam works well here too) and immediately decorate by drizzling colored sugar, sprinkles, or whatever you wish on top, before the candy coating dries. 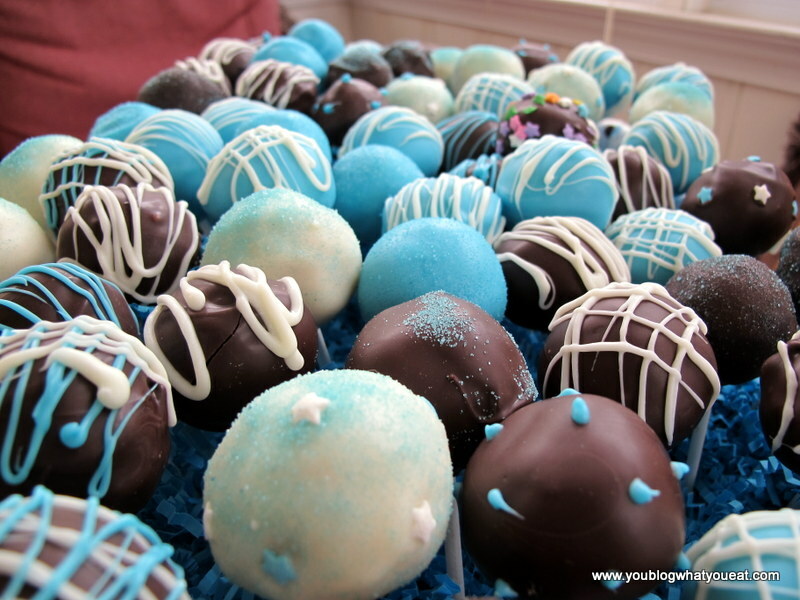 You can also drizzle a contrasting color of candy melt on top by melting them in a plastic bag and snipping off the corner of it, then squeezing it out as you move the bag back and forth over your cake pops. Continue until all are complete! You’ll note that sometimes the cake pops crack.. I’ve heard this can have to do with the candy melts being too thick or the cake pop being too cold and then expanding as they warm. Don’t leave your cake balls in the freezer for too long before decorating. After you’re done, place them back in the refrigerator until you are ready to serve. They last for several days at least before drying out, as the candy melt coating keeps the inside moist! For display, I bought a basket from Michael’s crafts, laid the styrofoam inside at an appropriate height, placed the cake pops in the foam, and then covered the foam with decorative crepe paper. They look great and everyone loved them!